The Coen brothers’ Hail, Caesar reviewed. The Coen brothers’ new movie (about movies) is one of their very best. 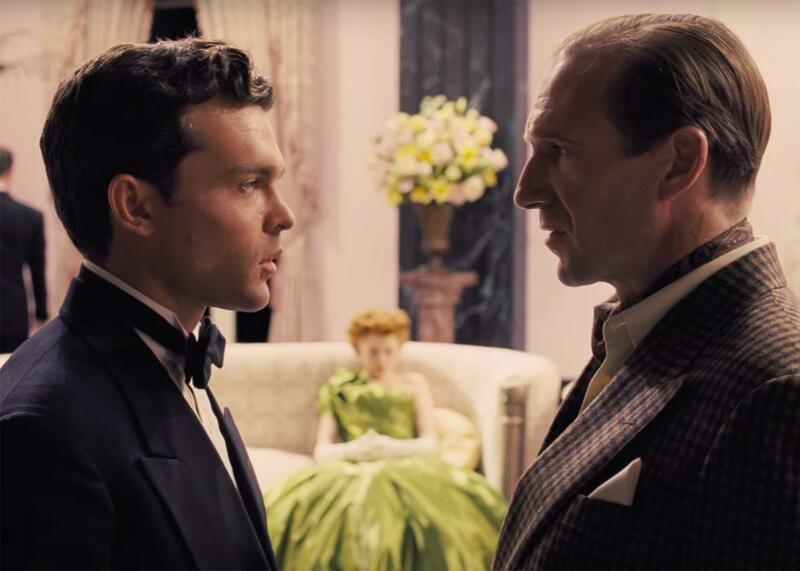 Alden Ehrenreich and Ralph Fiennes in Hail, Ceasar! What is Hail, Caesar!? What isn’t Hail, Caesar!? It’s a comedy, a noir, a historical epic, a musical (of two different varieties), and a melodrama. It’s a movie about the glory days of the industry that churns them out, and how the system so often resembled 1,000 spinning plates wobbling in perfect harmony for a split second. It’s a film about faith, and the pivotal role that it plays in one man’s search for meaning amidst the chaos of existence. It’s a tale of the Christ, told by two Jews who wouldn’t trust Jesus to save a cat out of a tree, let alone someone’s mortal soul. That is to say: It’s a Coen brothers movie, and one of their very best. The most obvious point of comparison, however, isn’t a Coen brothers movie at all, but rather Wes Anderson’s The Grand Budapest Hotel. The cosmetic connections hit first: Both films premiered at the Berlinale and opened in theaters shortly thereafter. Both films shift through several different aspect ratios and feature Ralph Fiennes, Tilda Swinton, and—wait for it!—Fisher Stevens. Both films bake their darker underpinnings beneath a frivolous screwball glaze. More crucially, both films probe the ultimate value of storytelling, and leverage their findings into lucid summations of their creators’ entire career and creative worldview. Hail, Caesar! takes one of the diverse back catalogs in American cinema and forces its various components into a reluctant conversation that changes them all, like strangers who are forced into small talk at a cocktail party only to realize that they have the whole world in common. The Coens tackled the Old Testament with A Serious Man, and with Hail, Caesar! they’ve moved on to the New. Our story begins in the early 1950s, Hollywood’s golden age. Eddie Mannix (Josh Brolin) is technically the head of physical production at Capitol Pictures—the same studio for which Barton Fink was once hired to write low-rent wrestling pictures—but in reality he’s a “fixer,” tasked with keeping pictures on budget, stars in line, and gossip columnists so focused on chum that they can’t sniff the bloated corpse floating a few feet deeper. Introduced inside of a dark confession booth, Mannix is starting to doubt the value of his work and the worth of the pictures that he tirelessly endeavors to make possible. Mannix isn’t worried about hits or flops; he’s worried about the cosmic purpose of the film industry, and the existential value of his role in sustaining it. Suffering for the sins of a make-believe world, Mannix is effectively the Jesus Christ of the backlot, and he’s waiting to be crucified at any minute. His faith is being tested. Over the course of 36 hours, each one of which assumes the weight of mortality, Mannix will be forced to find meaning amidst chaos and to believe—truly believe—in something bigger than himself. “A day or a lifetime,” read the sign that Barton Fink saw behind the desk of the Hotel Earle. That’s Mannix’s choice too. One of the joys of watching Brolin steer his character through a tour of 1,000 trials is that his deadpan demeanor makes it hard to divine the difference between a major crisis and an ordinary Tuesday morning. DeeAnna Moran, for example, is the kind of routine headache Mannix couldn’t live without. Played by a wonderfully unsubtle Scarlett Johansson, she’s Capitol Pictures’ very own Esther Williams, introduced in a gorgeous aqua-musical sequence that naturally ends in an impromptu act of violence. The Virgin Mary of this story, Moran is pregnant with the child of a married man, and it’s up to Mannix to defuse the scandal and protect his starlet’s brand of innocence. He knows exactly what to do—he lives for this. Delightfully complicating Mannix’s schedule is young Hobie Doyle (a revelatory Alden Ehrenreich), a Hollywood hillbilly who’s being groomed for mainstream stardom. Abruptly promoted from low-rent Westerns to a role in a melodrama that bears a striking resemblance to A Place in the Sun, Doyle and his limited skill set immediately become a headache for the film’s fussy director, Laurence Laurentz (Ralph Fiennes). But it’s nothing that Mannix can’t handle. Viciously competitive gossip columnists Thora and Thessaly Thacker (Tilda Swinton and Tilda Swinton) picking at the juicy scraps of a potential scandal? A walk in the park. But when doltish movie star Baird Whitlock (George Clooney, playing his fourth and finest Coen brothers idiot) is kidnapped from the set of a wannabe Ben-Hur and ransomed for $100,000 by a group who call themselves “the Future,” you can start to appreciate why the real Eddie Mannix—a fixer for MGM—died of a heart attack. The Future, it turns out, is the one thing Eddie Mannix never saw coming. Indeed, the future is the one thing that Coen brothers characters never seem to think about. Most of them, like the doomed hero of The Man Who Wasn’t There, are small cogs that come unglued in large machines, rattling around the metal intestines of a system they can either understand or control, but never both at the same time. In Burn After Reading, a league of morons confuse an errant CD for top-secret government information, kick-starting a chain of events so nonsensical that even the CIA can‘t figure out what to make of it. In A Serious Man, Larry Gopnick’s brother works on a book that charts “a probability map of the universe” while poor Larry is powerless to do anything in a world crumbling around him but brace for his suffering, the Job of Suburbia. In No Country for Old Men, Brolin himself played a reluctant Samaritan who openly acknowledged the stupidity of his actions but was powerless to stop himself all the same. For Mannix, the future is as much of a threat as it is a temptation—on this, of all days, he’s targeted by a persistent headhunter from Lockheed Martin, who tells the fixer that entertainment is frivolous and offers him a small fortune to leave the business before it’s too late. Coen heroes have always self-identified through the lens of their work—one is a police officer, one is a lawyer, one is a folk singer, one is a barber, one is a repeat o-ffender—which makes a film studio the Platonic idea of a setting for a Coen brothers movie. At Capitol Pictures, every individual’s worth is determined by their contribution to the collective, which in this case is a movie. With its immaculately restless attention split between actors, extras, directors, and—in one perfect scene—an editor, Hail, Caesar! is a fiercely auteurist work that’s generous enough to recognize how a single creative vision hinges on an infinity of singular creative voices. But here’s the thing: Capitol Pictures is a disaster. We only see its films in fragments, but most of those fragments are terrible. Baird Whitlock’s biblical epic looks hammy enough to eat for Christmas dinner while TCM would be too embarrassed to play Hobie Doyle’s latest oater at any hour of the night. Some smart snips might salvage Laurence Laurentz’s prestige pic, but even Roderick Jaynes can only work so much magic. And then there’s the studio’s latest musical extravaganza, in which all-American hunk Burt Gurney (Channing Tatum, fulfilling his destiny as the Gene Kelly of our time) plays a horny sailor who’s about to set out to sea with his mates. As the fellas sing a magnificently lewd ode to all the women they’re leaving behind on shore (“We’ll see a lot of fish, but we’ll never clog a dish!”), it’s clear that these boys don’t need to be on a ship in order to drop anchor. Indulgently long and choreographed to winking perfection, the “Dames” sequence is one of those primordial jolts of cinematic nirvana that puts everything into perspective. As in many of the scenes in this seriocomic masterpiece, the joke is broad and writ large, but delivered so well that it never feels simple. On the contrary, it convincingly argues the value of filmmaking to a universe of indelible characters who are struggling to understand it for themselves. It’s a truth they could see if only they had faith. And that, ultimately, is what Hail, Caesar! argues with greater clarity—if not always greater force—than any of the Coens’ previous films. There is no meaning but that which we convince ourselves. It doesn’t matter if you adhere to communism, religion, or movies: The only way you can believe in yourself is if you believe in something bigger. Who wouldn’t want to be a lobby boy at the Grand Budapest hotel, sir? It’s an institution. The picture—and this is one of the only contemporary films that someone younger than 50 can refer to as such with a straight face—may be too light on its feet to match the tidal pull of Inside Llewyn Davis or A Serious Man, but it nevertheless takes you to the same place. If the Coen brothers’ dramas are cautionary tales, their comedies are veritable how-to guides for people who can’t help but enjoy a mirthless chuckle at the humility of human existence. Yeah, the joke is on us, but that doesn’t mean it isn’t funny.